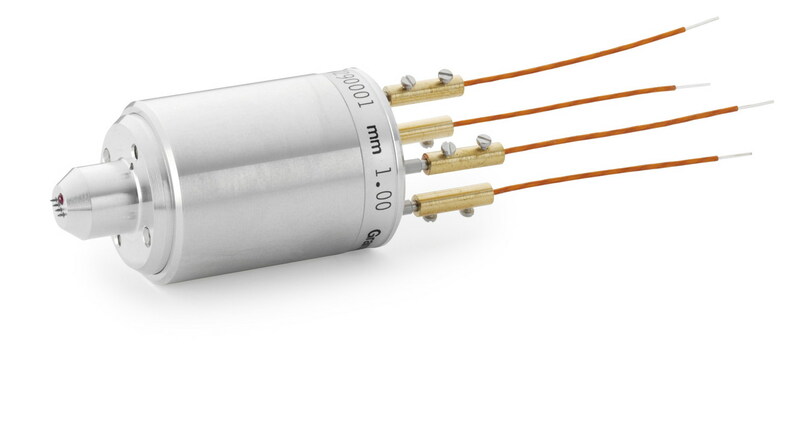 The JANDEL ENGINEERING LTD. Cylindrical four point probe is available in a special version for use in a high Vacuum environment. The Hi-Vac version of the Jandel cylindrical probe head has been successfully used in vacuum that was at 1 x 10^-10m bar. The application was described in the “Journal of Physics: Condens. Matter 3 (1991) S291-S296”. The probe head is supplied with all of the usual components except the insulating nosepiece pad is ruby, the tension adjusting screw is PTFE, and isolated terminal pins extend through the top of the probe instead of being soldered internally into brass pins. Only a tiny amount of soldering is done internally where the phosphor bronze ligaments connect into brass pins. The connection of the ligaments to the needles is done with crimps, removing the need for brazing or soldering. Four 24″ single conductor vacuum compatible leads are connected to isolated pins using brass connectors and stainless screws as shown in the image above. Alternately, the customer can supply the lead wire of their choice. Non-anodized aluminum alloy is used for the body, nose-piece, and top, instead of the usual anodized material. The characteristics for the probe need to be defined, i.e., spring load, needle tip radii, spacing, and whether a linear or square probe pattern is preferred. It has a 1″ diameter body and is 1.9″ high (25.4mm x 48.5mm high). The probe weighs 40g. Specifications for tip radii, spacing, and planarity are verified by calibrated instruments which include video inspection systems and an optical interferometer. Loads are verified by electronic force gauge. Needles have upper and lower jeweled bearings. The temperature rating of the Hi-Vac probe is for use at up to 120o C in an oven, however, upon request it can be built for use at up to 200o C at no additional charge.